Martial arts and self-defense are two different things! Unless you train with this in mind, it could go horribly wrong for you. Rory Miller, Lawrence Kane, and Kris Wilder have been working tirelessly to help martial artists and safety-minded people flush out what it takes to stay safe and stay out of jail, should a violent encounter happen to you. 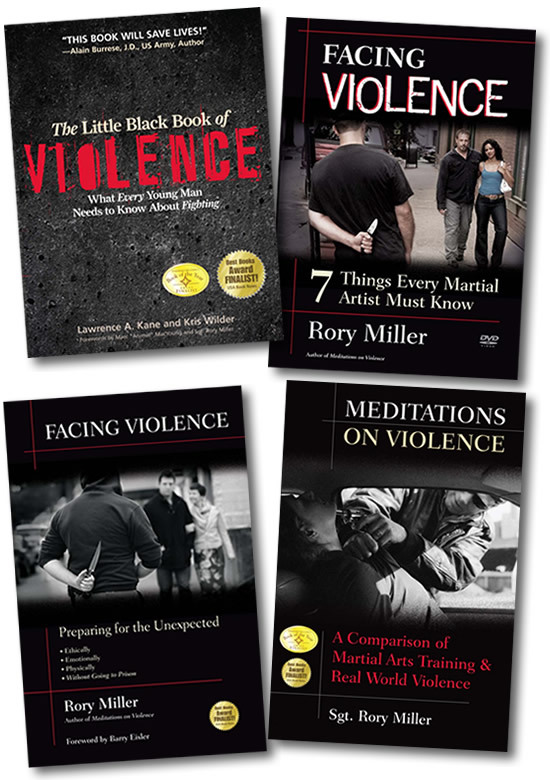 With this acclaimed collection of books and video, you will plumb the depths of martial arts and real world violence. You will learn seven critical elements that must be understood if you are truly going to stay safe and out of jail for defending yourself. Includes 3 books and 1 DVD. There are seven elements that must be addressed to bring self-defense training to something approaching ‘complete.’ Any training that dismisses any of these areas leaves you vulnerable. 1. Legal and ethical implications. Experienced martial artist and veteran correction officer Sgt. Rory Miller distills what he has learned from jailhouse brawls, tactical operations and ambushes to explore the differences between martial arts and the subject martial arts were designed to deal with: Violence. How to think critically about violence. The predators who perpetuate it. Training for violence, and adapting your present training methods to that reality. How to make self-defense work. The cost of surviving sudden violence or violent environments. Every time you engage in violence, no matter how small or trivial it may appear to be at the time, it has the potential of escalating into something extraordinarily serious. What is really worth fighting for when you might find yourself spending the rest of your life behind bars, confined to a wheelchair, or trying to dig yourself out of bankruptcy from beneath the crushing weight of a civil lawsuit? It is important to ask yourself, "Is this really worth fighting over?" While in some instances the response could legitimately be "Yes," more often than not it ought to be "No." 1. Every martial artist must learn force law, and explore his or her own ethical limitations. Mr. Miller explores this issue so you may determine where this often-overlooked ethical line lies within yourself. 2. Unfortunately, many martial arts and self-defense classes do not train for reality-based violence, focused upon how attacks most-commonly happen. Mr. Miller teaches you to recognize an attack before it happens and know what kind of attack you are facing. 3. You will learn and practice escape and evasion, verbal de-escalation, and avoidance of dangerous situations. 4. In the unfortunate event that you are attacked unexpectedly, you will need a handful of actions trained to reflex level for a sudden violent attack. 5. Freezing is almost universal in a sudden attack, even for experienced law personnel and expert martial artists. Students must learn to recognize a freeze and break out of one in order to react to an attack quickly. 6. Mr. Miller explains that your training needs to be in line with how violence really happens in the world. 7. There are potential legal, psychological, and medical effects of engaging in violence, no matter how justified.